How are you big-hearted humans today? This is a response to Kim’s post on the perils of getting back into bike riding. I had too much to say for a comment. Let’s make it a Live Bold List! 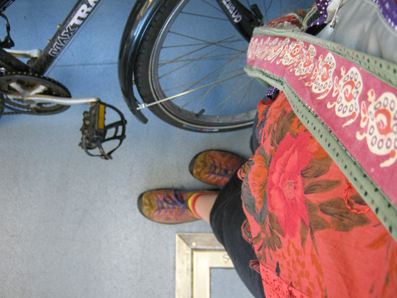 Wear your ‘day clothes’, not lycra. Watch out for coats, scarves, full/long skirts and flared pants for we don’t want them getting caught in the spokes or chain. See also #5. My valve caps have little flowers. This is my most extravagant purchase, even though they were under $10, as they weren’t totally essential to Meg-ifying my bike. Like the bell, I bought them locally but similar things can be sourced online. If you’re going to be wearing jeans, you might need to roll them up (at least on one side) so they don’t get caught in the chain. If that is the case, prepare beforehand and wear stripey socks. Even if no-one else sees you this makes for a smiley ride :) See also #1. 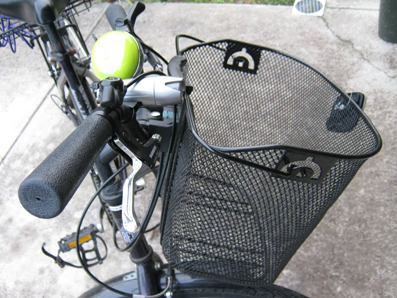 I have big baskets attached to the front and back of the bike for carrying my handbag, lunch, shopping etc, and a nice wide seat for comfortable sitting. 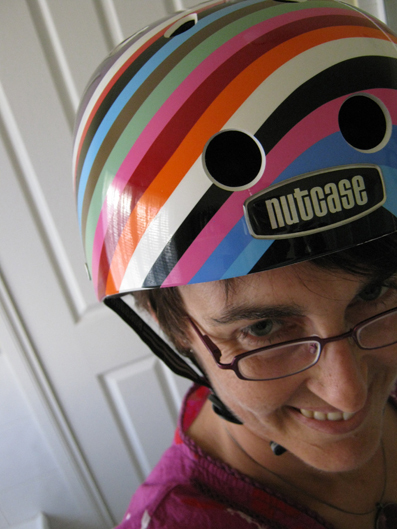 For visibility: safety sash (in purple with spots) [later: no longer available] and for brain care: a groovy helmet. A shiny red metal water bottle goes in the front basket. A good map of local roads is handy, specially for the first few rides. Riding beside cars on big roads is a complete NoNo for me. In our city they’ve made special maps so you can find rider-friendly smaller roads that connect. I am pretty sure there’s an iPhone app that helps with this too. Sometimes you can even go via laneways and through road blocks where cars cannot! Find a bike shop where the people speak to you in a civilised manner. I wont say too much about the ones that dont – except that I never. go. back. to. them. The ones where the people know what they’re talking about and they speak to me nicely? I return. Again and again. Maintenance and upkeep: recently I had a new chain and rear cog thingy fitted (riding is so smooth now) and new “v” brakes (it’s a real improvement having brakes that work!) I use “toe” clips (which you slide your ‘day shoe’ into, you can see them in the top photo) but not clips that need the clickety clack shoes and could maybe get stuck. 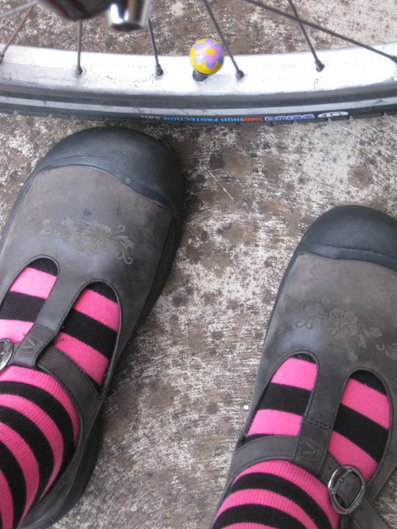 I am toying with the idea of taking the toe clips off the pedals, actually. I am very comfortable paying professionals to fit things to and maintain my bike. It’s good for society to retain people with these skills, and it makes my bike time easier and less oily and dirty. 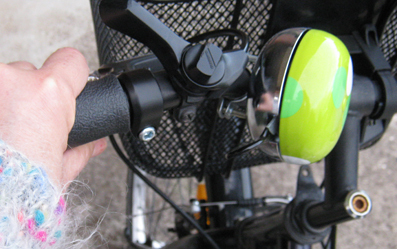 Bike maintenance costs way less than car maintenance! Steel yourself for the fact that the lycra people may not acknowledge you. But you’ll have a smile on your face for the rest of the day when someone else in day clothes with flowers on their handle bars smiles at you and you both recognise a kindred spirit. I would like to thank Brandi Reynolds for her Move: A body journey e-course [later: no longer running]; Brandi reminded us to imbue your movement/exercise with fun. If it’s enjoyable you’ll keep doing it. True. Your comments make my day, dear ones!